This page is taken from the Burngreave Messenger who published this interview with David in 2016. David gave a TEDx talk in Pitsmoor Sheffield as well. David was born in Bystrany, Slovakia, the third of four children. His family had lived in the Czech part of Czechoslovakia before the country split into two separate republics in 1992. When the EU expanded to include Slovakia in 2004, his dad, a former teaching assistant, decided to go to the UK for work and headed for Cardiff. Within two months he had found a job, a house and was starting to master English. David, his brother and their mother came to join him. At age 13, David waited a year for a school place but when he did get into school he found the curriculum difficult. In Slovakia most Roma children are educated in separate schools where expectations of the pupils are low and the quality of lessons is poor. David admits that he struggled too with the variety of different cultures at the local school in Cardiff, getting into trouble and finally being excluded. The family then moved to Sheffield in 2007 when David was 16. He finds Sheffield people respectful, friendly, open-minded and fair. But there he was with no GCSEs – what was he to do? He was friendly with a local Asian shopkeeper who, realising his potential, offered to train him up and let him help run the shop. David, boosted by this trust, started to study again. 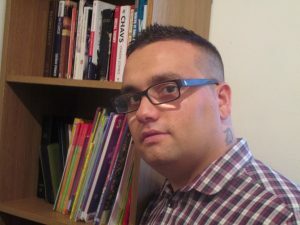 Over the following years, he studied adult literacy and numeracy at the Fir Vale Centre, Health and Social Care at Hillsborough College, and English and Maths whilst working at Fletchers Bakery and later as a teaching assistant at Whiteways and Limpsfield schools in order to support his new family. And now? He is jubilant that he has been given an unconditional offer from the University of Sheffield for a BA in Education, Culture and Childhood. He will stay on in his Limpsfield post but also start a new part time job working for Sheffield Council as a Roma Placement Officer, organising adult education places for his community in Page Hall, Tinsley and Darnall. He is thrilled and incredulous when he looks back at his route from a young, angry, semi-literate adolescent to a studious, hard- working university undergraduate. He credits the Christian Mission Maranata Church for his belief in the possibilities of change and achievement. His wish now? To inspire others. Good luck and may David be the first of many Roma university students.